Friday Light Supper Event - you must register and pay no latter than 4:15 or you can not be included in the meal. 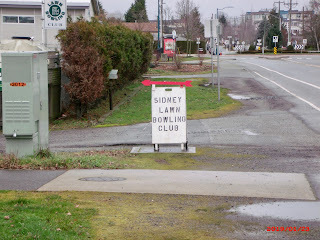 Welcome to the Sidney Lawn Bowling Club - striving to be the friendliest club on Vancouver Island, British Columbia! We are a well-established (1998) lawn bowling club operating out of a full facility club house close to the ocean across from Tulista Park in Sidney, BC. Our membership fees are reasonable and we offer year round sport and social activities. Our club maintains a membership of around 160 active bowlers and 20 social members with an active Junior program. WANT TO LEARN HOW TO PLAY THE GAME OF LAWN BOWLING? WE CAN TEACH YOU AT NO COST. VISIT OUR OPEN HOUSE DURING THE MORNING OF SATURDAY, APRIL 27, 2019. YOU CAN TRY OUT THE GAME BY BOWLING A FEW BOWLS ON OUR BEAUTIFUL GREEN (our playing field) UNDER DIRECTION OF OUR FRIENDLY COACHES. WEAR FLAT SHOES WITH SMOOTH SOLES (BARE OR STOCKING FEET ARE OPTIONS). FIRST IMPRESSIONS ARE USUALLY A GOOD GUIDE SO IF IT FEELS LIKE SOMETHING YOU WILL ENJOY, SIGN UP FOR FREE LESSONS TO START ALMOST IMMEDIATELY. AGE IS NOT A BARRIER. WE HAVE BOWLING MEMBERS ANYWHERE FROM IN THEIR MID-90S TO THEIR PRE-TEEN YEARS. STILL WORKING? NOT A PROBLEM, WE HAVE PROGRAMS DESIGNED TO FIT A WORK SCHEDULE. ITS EQUALLY A GREAT COMPETITIVE SPORT AND A GREAT SOCIAL SPORT - THE CHOICE IS YOURS. IF INTERESTED BUT UNABLE TO ATTEND THAT SATURDAY LEAVE A MESSAGE ON OUR VOICE MAIL FOR A RETURN CALL. Visitors may view all pages of this site by using the NAVIGATION chart in the top left panel. Leave a Voice Mail message for a return call. We will be accepting new members in the Spring of 2019. Attend our Garage Sale and Bowling Demonstration on April 27, 9-1 to try out the game and register for free instruction to learn how to lawn bowl. 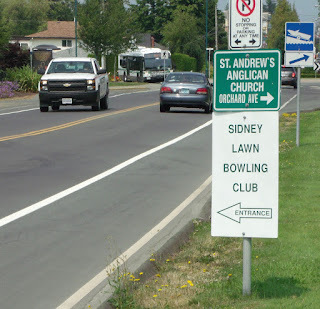 Our club is located at 9580 Fifth Street in Sidney, behind a fenced compound housing a municipal maintenance facility. The club sits behind the compound and borders Iroquois Park. Travelling South, heading out of town, on Fifth Street; the gated entrance to the club is about a block past the traffic circle at Fifth and Ocean and the first driveway on the right, past the Food Bank Building. TRAVELLING NORTH ON THE PAT BAY HIGHWAY (HYW 17 N) FOLLOW THE USA FERRY SIGNS WHICH WILL TAKE YOU IN THE DIRECTION OF SIDNEY ALONG LOCHSIDE DRIVE. AS YOU APPROACH TOWN, LOCHSIDE TURNS INTO FIFTH STREET. YOU WILL SEE A LARGE PUBLIC PARK ON YOUR RIGHT. STREET SIGN ON RIGHT WARNS OF OUR ENTRANCE ON THE LEFT. SHOULD YOU MISS IT CONTINUE THE SHORT DISTANCE TO THE TRAFFIC CIRCLE, GO AROUND IT AND DOUBLE BACK. ON OCCASIONS WHEN EXPECTING VISITORS A SIDEWALK SIDE WILL BE DISPLAYED AT THE ENTRANCE TO OUR DRIVEWAY. Progress of the game in England had some interesting moments in history. 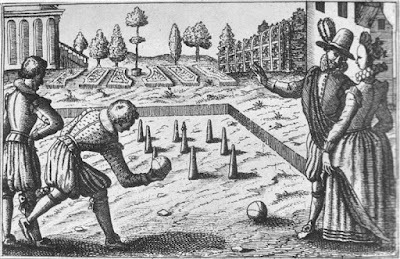 King Richard 111 suppressed the game by legislating a six-day stay in jail for playing bowls. He felt that the game was taking away from the practice of archery and thus affecting the supply of men to the King's Arms. Another interesting moment in the history of the game occurred when Sir Francis Drake was engaged in a game on the sward of Plymouth Hoe. It was here that word was received that the invasion of England by the Spanish Armada was imminent. Drake, however, took the time to finish his game before leading the English fleet to victory (It is rumoured that he had to wait until the tide came in to float his ships). King Henry V111 and his daughter who later became Queen Elizabeth 1, were very fond of the game and not adverse to laying a wager on the outcome of a match. King Henry passed an act forbidding any but the wealthy from playing the game, thus limiting it to the nobility. 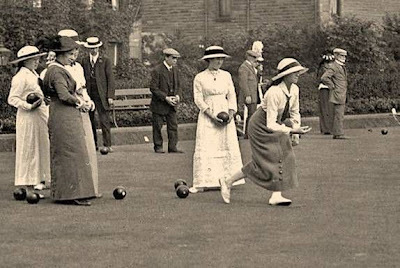 This is why the game of Lawn Bowls is often referred to as "the gentleman's game" The act was not repealed until 1845, and once it was repealed, the modern game began to flourish in Great Britain. A code of rules was prepared in the mid-1800s under the guidance of a Glasgow solicitor. It remains almost unchanged to this day. A standard for the biased bowl was adopted in 1895. 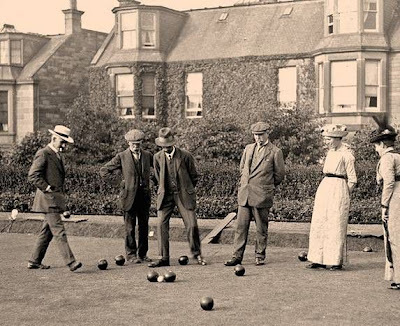 Popularity of the game of bowls spread throughout the colonies of the British Empire and its popularity still remains highest in the Commonwealth countries with Great Britain, New Zealand, Australia, South Africa and Canada being the main centres of the game today. Bowls is a recognized sport in the Commonwealth Games. Over 30 countries compete in the World Bowls Championships, which are held very four years. In Canada, bowls is played socially and competitively in clubs from coast to coast. Lawn Bowls is played on a section of a grassed area called a "rink". Players form teams and alternately roll two, three or four bowls (the number depends on the game being played) aimed at a small white ball called the "jack" which has been positioned near the end of the rink. A game is made up of a series of contests called "ends". In each end, the winning team scores one point for each of its bowls that ends up closer to the jack than the closest of the opposition's bowls. At the end of the game, the team with the greatest total score is the winner. Whereas the jack is a round ball, the bowls are not. One side of the bowl's running surface is slightly flattened and weighted to form a "bias". When initially released, the bowl tends to follow a straight line; however, as it slows down it travels towards the weighted side and its path curves in that direction. The bowler's stance, position and speed of release all influence the bowl's path, as does the condition of the grass and even the wind. To add to these challenges, the jack can be struck by a delivered bowl and be relocated on the rink and yet still be in play. 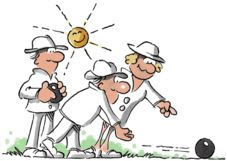 What's the Best Feature of Lawn Bowling? Many of our members would reply; "it's the flexibility". How flexible is it? Well for example, the game can be played - "one on one", or with three players keeping individual scores, or it can be played as teams with two, three or four players. Also there are numerous opportunities during each week to bowl and best of all you are not always committed. Simply attend the clubhouse 15 minutes before the scheduled time of the event and enter your name in the draw. Teams are selected randomly and the game is on. If you like competition there are opportunities during the season to enter tournaments, but here you should accept the commitment to attend - your team members will be depending on you. You can be as competitive as you wish; from social bowling all the way up to the championship level. And that is what we mean by being flexible - a commitment only if you choose at a level of competition that you decide. We are a friendly, non-profit club that features bowling most days of the week during summer and winter. 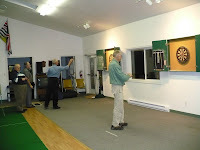 During the winter months we have additional indoor events such as ; darts, mah jong, cards, board games. Throughout the year we have a variety of social events. Social bowling is based on a draw meaning our members are not committed to a team and have the opportunity to bowl and make friends with a wide variety of male and female members. Members check the activities listed on the Schedules Page, select an occasion which suits their schedule, arrive 15 minutes beforehand to register and they are "good to go". Games are usually 12 ends and last between 2 to 3 hours and some events feature a social break with refreshments. Tournaments within the club and with other clubs on the Island and the mainland occur at various times during the season and normally require advance registration. We are affiliated with the national organization through BowlsBC and along with 10 other local clubs form Bowls South Island (BSI) thereby offering opportunity to participate through to the highest levels of competitive bowling. Age is not a barrier in lawn bowling. We offer a sporting and social outlet to the adult and a fun filled learning opportunity for youth through our Junior Program.